I have not been able to fish too much this year it seems but I am certainly getting my fill right now out here in Southwest Florida. Every year we spend the holidays with my wife's parents on Marco Island, and, well, with the flats boat docked 20 feet from the back door, we tend to get some time on the water. 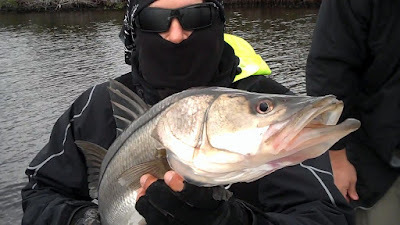 We also make a few trips down to the Everglades to fish with Kevin Mihailoff. After 5 years of fishing with Kevin, there is no doubt in my mind that he is the best guide in the area. He always finds the fish and Monday was no exception with 30 snook to the boat - including this nice fish that my brother-in-law caught that measured 31 inches.